In addition to providing water treatment solutions, RK Water is also a custom manufacturer for inventors and investors that need to bring technology ideas to life. We can assist with product design and can fabricate fully functional commercial and industrial-grade products and equipment. RK Water operates a leading-edge fabrication facility and utilizes advanced design planning to manufacture innovative technology products. WIT has revolutionized water using patent-pending electromagnetic reactor cells that convert liquid water into a stable gaseous form of water known as SG Gas. This is not another water filtration system. The WIT machine reactor cells convert water at the fundamental molecular level. The WIT Machines are designed to operate in most industrial and commercial environments and economically produce SG Gas with extremely consistent quality. A primary application for SG Gas is to infuse it back into liquid water. The result is the creation of polarized water, the best ingredient for enhancing products to meet the growing demand for health conscious food, beverages, cosmetic and nutraceutical formulations. Polarized water is different at its molecular basis, and occupies an exclusive category when compared to other types of water. Polarized water is a stable crystalline-like molecular structure (dioxytetrahydride) that is enriched with electrons. It has been shown to improve the efficacy of many consumable products as well as growing processes for food production. WIT technology offers a wide range of potentially game-changing industry applications that are attracting the interest of licensees looking for truly innovative product development. 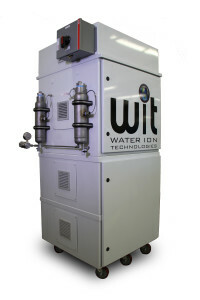 RK Water is the exclusive manufacturer of the WIT Machines, all of which can be customized or scaled for commercial, industrial and government applications such as: more energy-efficient water purification; healthier food, beverage and cosmetic formulations; and more robust plant growth and accelerated food production. Each WIT Machine operates under both a use license issued by WIT plus a service and maintenance agreement with RK Water. The 80-Cell WIT Machine shown here generates approximately 50 liters per minute of SG Gas. Upon infusion into purified water, this SG Gas will yield 6,000 gallons of polarized water in approximately two hours. In commercial applications where water usage is high, the SG Gas also can be used for pretreatment of incoming water to extend the life of R.O. membranes and consequently, conserve water and reduce energy costs. Alternatively, because polarized water offers increased oxygen and hydrogen availability, it is also used to optimize other ingredients that are added as they are stabilized and become more bioavailable. This can enhance agricultural growth, food processing, beverage, nutraceutical and cosmetic formulations. Several 10-Cell WIT Machines are operating at health clinics under use licenses with the supervision of medical practitioners who are documenting their observations while treating their patients including those suffering from respiratory ailments. In less than two months in early 2016, RK Water completed the design and fabrication of WIT’s first 4-Cell Machine so that WIT could launch an additional licensing alternative. This is the “baby brother” of the larger 10-Cell and 80-Cell Machines. The 4-Cell Machine is a smaller, more easily portable machine that is ideal when space, mobility and lack of electric power are key issues, such as in remote areas of the world.